Senator Harry Reid wants Bundy out of the 600,000 acre Gold Butte area so it can be used for future solar projects, which includes a deal with the Chinese. The deal stretches across several states, not just this area in Nevada. 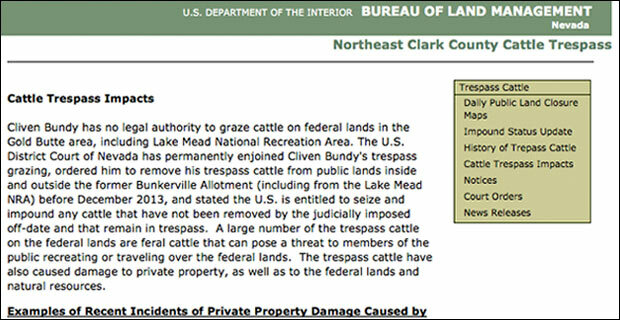 Documents on BLM’s website illustrated the planning, and were pulled off the site in an attempted cover-up. However the documents were retained by patriot site FreeRepublic.com. See these documents on our site. Senate Majority Leader Harry Reid (D-Nev.), who was exposed last Friday as the mastermind behind the Bureau of Land Management’s persecution of Nevada rancher Cliven Bundy, can be seen in this March 2014 photo breaking ground for a solar farm near the Bundy Ranch, emphasizing that the senator’s plan for solar projects in Nevada wasn’t just limited to the shelved solar farm near Laughlin. Signaling the first day of construction of the Moapa Southern Paiute Solar Project, which is about 35 miles from the Bundy homestead in Bunkerville, Nevada, Sen. Reid joined representatives from the Moapa Band of Paiutes, executives from First Solar, Inc. and the Los Angeles Department of Water and Power for the groundbreaking ceremony on March 21. 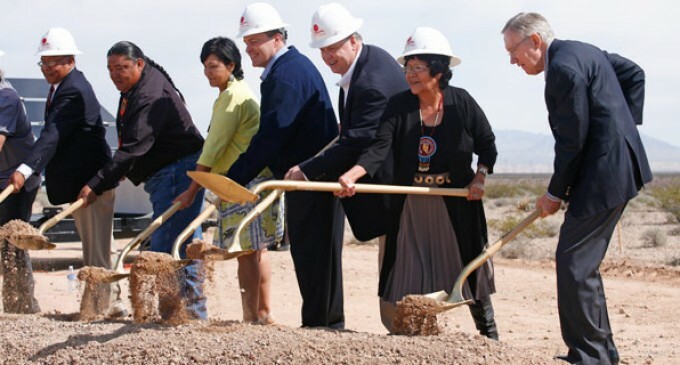 “First Solar is thrilled to celebrate this important milestone with Sen. Reid and distinguished guests, and honored to work with the Moapa Band of Paiutes on this landmark project,” Jim Hughes, the CEO of First Solar, said at the time. The development of solar farms just as this one is exactly why Sen. Reid was using the BLM, whose director is Reid’s former senior advisor, to push Bundy out of the Gold Butte area his family has worked for over 140 years. 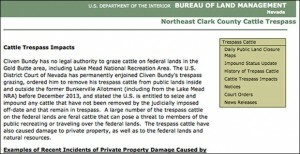 The BLM attempted a cover-up by deleting documents exposing the plan from its web site, but fortunately contributors at the Free Republic were able to save them for posterity. 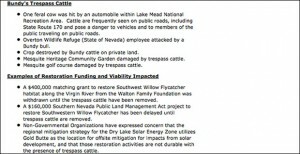 Others have attempted to whitewash the situation by suggesting that the solar farm project is only limited to the shelved 2012 deal between Sen. Reid and Chinese-owned ENN Energy Group in Laughlin, Nev., but by reading the BLM’s own documents it is quite obvious that this is not the case. “The Regional Mitigation Strategy for the Dry Lake Solar Energy Zone is the first of several pilot plans to be developed by the BLM,” the press release added. 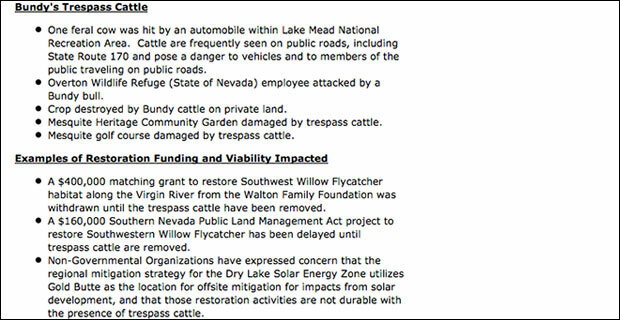 In summary, the BLM, acting under Sen. Reid’s corrupt interests, wants Cliven Bundy out of the 600,000 acre Gold Butte area so the agency can use the land for future solar projects and de facto buffer zones surrounding the solar farms. “This is just about power of the government…This is blatant intimidation on the part of the feds, and a good reminder that intimidation and violence on the part of the federal government is a very real possibility. This is exactly why the Founders intended for us to be able to arm ourselves. The federal government can quickly become tyrannical, and when it does, citizens have a moral right to fight back. Next time someone asks why individuals should be able to own assault weapons, this situation is a good example of exactly why. Crooked politicians…..are there any left who aren’t corrupt? Nice pic. Probably the closest he’s ever been to real work… the parisitic scumbag. The day he goes to room temperature, I’m going to have a party. Hopefully it’ll be after he’s tried, convicted and executed… for TREASON. A disrespect for human life, a disgrace to human life. Wonder what and how much his pay off is?????????? Their selling this country out,Still want to be a DEMOCRAP?